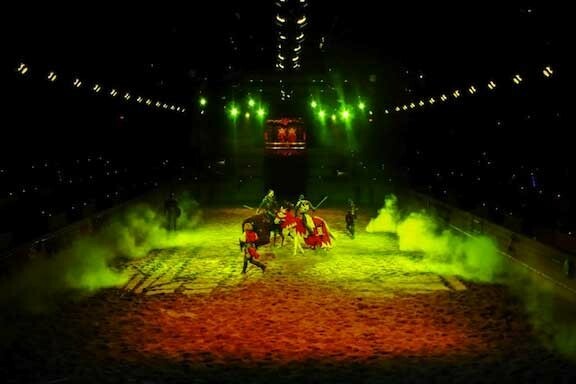 An exciting, family-friendly dinner attraction inspired by an 11th century feast and tournament, the Medieval Times Dinner & Tournament has been thrilling audiences across America since the first U.S. location opened in Kissimmee, Florida in 1983. Chivalry is not dead as visitors are treated to epic battle recreations by numerous colorful knights, a live jousting tournament and world class displays of horsemanship and falconry. A four course meal completes the dinner theatre experience. The firm was an early adopter of High End Systems' lighting technology, and since the days of the Intellabeam and the Hog II they have consistently utilized HES gear in their locations. To keep the lighting aspects of their latest productions on the cutting edge, the organization has been aggressively retrofitting their nine U.S. productions with the latest and greatest lighting and control gear from High End. Medieval Times' Sound and lighting manager Rick Grimes spearheaded the retrofits with the creative team, starting with his home base location in Dallas, TX. The Dallas redux commenced in October of 2011, where the existing rig of 16 Studio Color 575s and eight Cyberlight CX fixtures (controlled by a Jands Hog 1000) was replaced with a Road Hog Full Boar console, 16 Studio Colors, eight Cyberlight 2.0 and five intellaspot fixtures. Grimes says the Dallas budget allowed for an extra fixture for added dimension, thus intellspots were introduced into the rig. He explains: "Adding intellaspots to our design allowed for 'bell and whistle' effects like ultra wide washes, and spot, color or breakup patterns that were unachievable in the past - because every other fixture in the rig was functioning as a spot or wash in most of the scenes."